It's time for our latest RELEASE from CCDesigns and DoveArt Studios. A selection from vintage, nautical and nature. We are very excited about each of these new stamps and we know you will love them too!!! Each of our Design Team members (and Sue our special guest designer) will be sharing their inspiration with gorgeous projects that feature every one of these new stamps! This gorgeous scene needed nothing other than a simple background. I used and embossing folder with dragonflies for some texture. a few water drops were added using N6,3 and white multiliner. 3. When you reach the end of the hop, you will be at DoveArt Studios blog. There you will leave the name, or names of your favorite stamps in the release. Come back on Sunday morning to DoveArt Studios blog to see if you won a stamp or two from CCDesigns. I love your work always Dorinda, so beautiful! Love, love love this. I love lilies and the coloring is amazing! This is such a beautifully simple card. It really lets the image shine. I love the color choices you made. 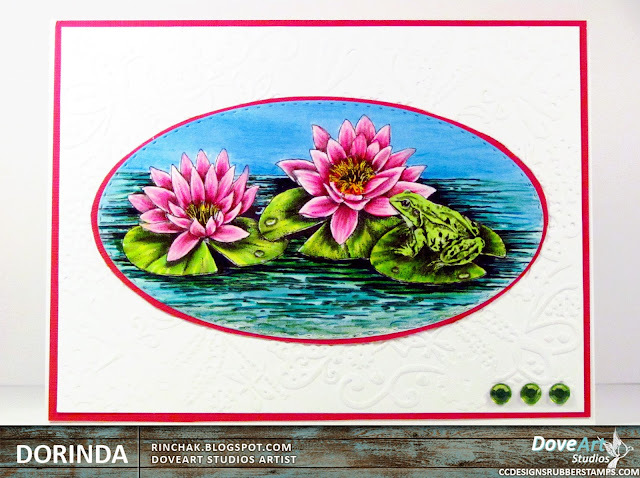 Gorgeous colors of this Lily Pad design! Love your beautiful card! Reminds me of a pet bullfrog we had named Biggie! Loved seeing him in our backyard pond! Knocked it out of the park. Coloring is fantastic as usual. I love your choice of colors and the depth. Amazing coloring on this fabulous image , Love it!! WOWIE!! love this... your depth, coloring.. the water is just awesome..
Everything about your creation is beautiful Dorinda. The water drops are a nice contribution! Love the stamp also. Beautiful Dorinda! I love how you colored the ripples in the water! I love the contrast of the colors you used! 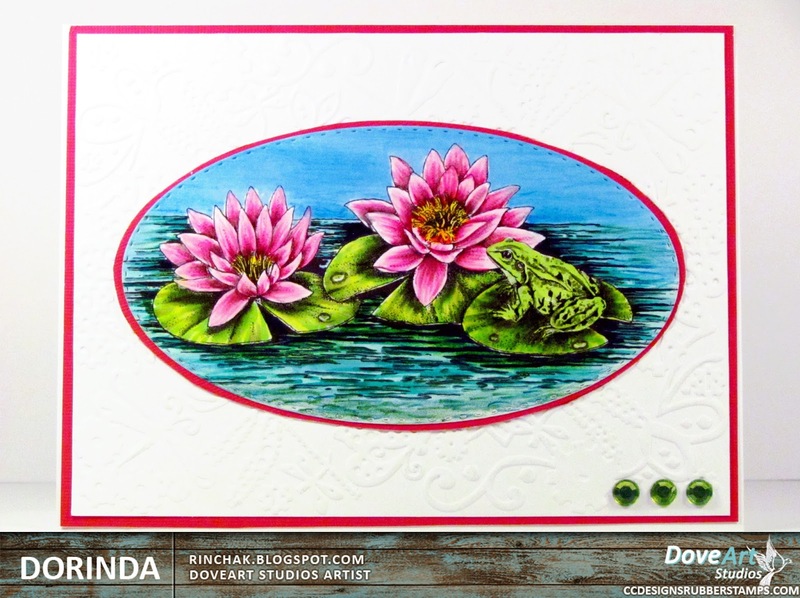 Your Lily pad card is so stunning! I love the cute frog. Beautiful flowers! The frog is cute also! Awesome! Love this wonderful image and your fantastic colouring. Really great job! Dorinda, the colors and contrast make them look so 3D. Beautifully done. This stamp makes me feel I am watching the Nature program on PBS. Thanks. Oh my favorite for sure! Love water lilies. It is already on my list! Oh my!!! Such adorable card!!! Lily pads and frogs always delight. You sure brought out the feelings of the water and conveyed the way the frog is deciding on which lily pad to hop to. Very pretty card with the pink flowers and the coordinating paper layering. Thank you! HA, we have a small pond in our garden, and this beautiful scene you have created is very familiar in the summer months to me. Wonderful bright colors and gorgeous coloring. Love the simplicity of your card, lets the stamped and colored image be the star of the card!!! What a wonderful artist you are. Love the way you captured the water lilies, reminds me of a pond we use to have. Great job! Beautiful. The water lillies look so real! Wow! You have truly made this image stand out with your coloring! I am simply blown away by your work! This is stunning!